In honor of the sun and great weather we had for (most) of this weekend, I pulled out this recipe for sunshine bars. You know what, though? I really don’t like the name of it. 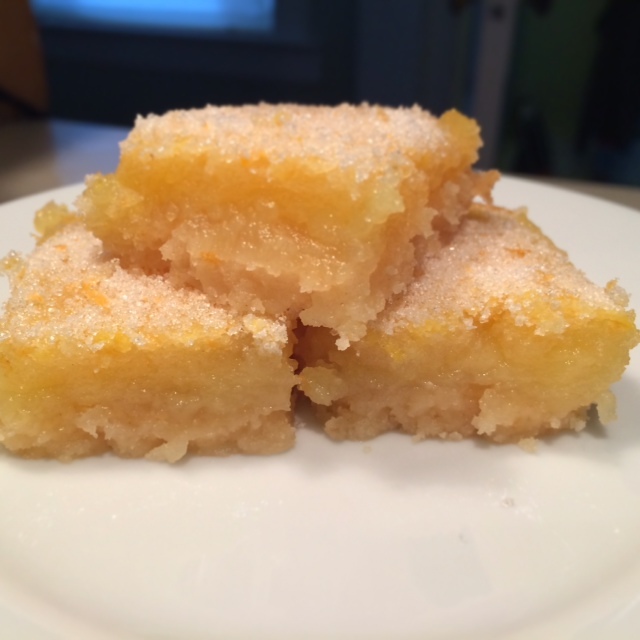 So I’m just going to call it what it is: lemon-grapefruit bars. I usually don’t spend a lot of time with dessert, but I’ve made a few over the last couple weeks that were pretty darn good. This is a really good one to make if you’re heading to a party and are on dessert duty. I like it because it makes a million little bites, and a little goes a long way. And what’s even better, it’s the easiest kind of baking you can do. Mix a little sugar, a few eggs, squeeze some lemons, done and done. It’s a totally approachable and easy dish to make, so give it a try if you’ve been shy about baking something! 1. Buzz: Measure sugar into the food processors. Drop in grapefruit zest. Buzz to a fine grapefruit-scented powder, about 1 minute. Scoop ¼ cup scented sugar into a small bowl; set aside. Scoop 2 ¼ cups scented sugar into a large mixing bowl; set aside. 2. Combine: Measure 1 ½ cups flour and the salt into the remaining ½ cup scented sugar in the food processor. Buzz to combine. Drop in butter. Pulse many times. Mixture will look like fine sand, then coarse sand, then big clumps. 3. Pat: Dump clumps into a 13-x-9-inch baking pan. Pat into the bottom of the pan. Slide into a 325-degree oven and bake until golden, about 25 minutes. 4. Whisk: Meanwhile, whisk remaining ½ cup flour into the scented sugar in the large mixing bowl. Whisk in juice. Whisk in eggs. 5. Bake: When pastry is golden, lower oven temperature to 300 degrees. Pour egg mixture over pastry and bake until center is just set, about 30 minutes. Pull pan out of oven. 6. Gild: Spread remaining ¼ cup scented sugar over the top. Cool. Chill. Cut into 48 bars.